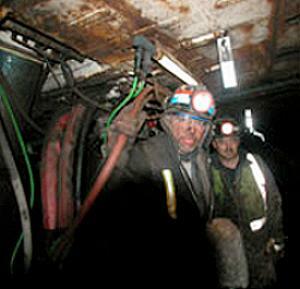 CHARLESTON, West Virginia, April 12, 2010 (ENS) – The U.S. Attorney in West Virginia today said he plans to prosecute any criminal activity related to the deaths of 29 coal miners in the Upper Big Branch mine explosion, the deadliest U.S. coal mine incident in 25 years. “The United States Attorney’s Office is ready, willing and able to receive any information and/or investigative reports regarding the explosion and subsequent deaths of the twenty-nine miners at the Upper Big Branch Mine in Raleigh County, West Virginia,” said U.S. Attorney Charles Miller in a statement. Miller said he would wait for the outcome of the federal Mine Safety and Health Administration investigation before deciding whether to prosecute the mine’s operators, Performance Coal, or its parent company, Massey Energy. “If the investigation undertaken by the Mine Safety and Health Administration reveals that criminal violations have occurred, we will work vigorously with investigators to pursue those offenses to the fullest extent of the law,” Miller stated. This afternoon, West Virginia Governor Joe Manchin and First Lady Gayle Manchin will take part in a wreath-laying ceremony at the state capitol in honor of the 31 miners involved in the mine explosion at the Performance Coal Company’s Upper Big Branch Mine. Monday marks the one-week anniversary of the mining disaster in which 29 miners lost their lives. Two other miners survived. During the event, which is open to the public, the governor will ask people from across the nation to join in a moment of silence to honor the fallen miners and their families. Today President Barack Obama ordered all flags on federal buildings in West Virginia to fly at half-mast. All state flags are flying at half-mast by order of Governor Manchin. On Saturday, families, friends, and supporters of West Virginia’s mining communities honored the lives of those lost at Massey’s Upper Big Branch coal mine with a candlelight prayer vigil in front of Marsh Fork Elementary School in Naoma, just five miles from the Upper Big Branch mine. The West Virginia Council of Churches has established the Montcoal Mining Disaster Fund, and is now accepting donations to be distributed among the families of miners who were killed in Monday’s explosion at Performance Coal Company’s Upper Big Branch mine. In addition, gifts and other items are being accepted for the families of the deceased miners at Appalachian Bible College. He said Massey’s focus now is attending to the families to ensure they have the support they need. “We continue to work diligently with state and federal authorities to try to determine the cause of this tragic explosion as quickly as possible,” Blankenship said. U.S. Secretary of Labor Hilda Solis said, “The best way that we can honor these miners is for the Mine Safety and Health Administration to do its job with the utmost integrity and thoroughness. I am confident that will happen. I saw firsthand the commitment and dedication of the MSHA staff when I was in West Virginia on Wednesday. In addition to the MSHA investigation, the House Committee on Education and Labor will hold hearings to determine what happened, said Chairman George Miller, a California Democrat. “Over the past few years, we have met too many family members who have suffered the tragic loss of loved ones in a mine disaster. On behalf of the committee, we promised them that we would do everything we could to learn the cause of these tragedies and to keep miners safe,” said Miller. The Upper Big Branch coal mine has a history of serious violations five times more extensive than the national average, according to federal records. The mine, at Montcoal in Raleigh County, was cited for 458 safety violations last year, with 50 of them listed as unwarrantable failures to comply. These are citations which federal mining regulators apply only to instances of willful or gross negligence. Nationwide, on average, two percent of safety violations are unwarrantable failures, but at the Upper Big Branch mine more than 10 percent of violations in 2009 were unwarrantable failures. Just six weeks before the Upper Big Branch disaster, witnesses told a House Education and Labor Committee hearing into mine safety violations that a flood of mine owner appeals of violations are delaying tougher penalties for the country’s most dangerous mines and undermining efforts to protect miners. When the Mine Safety and Health Administration cites a mine operator for a safety violation, the owners can challenge the violation to the Federal Mine Safety and Health Review Commission that currently employs 10 administrative law judges. Mary Lu Jordan, the chair of the Review Commission, told the committee that the average time it takes to dispose of a case has increased over the last three years, from 178 days to 401 days this year. There are now approximately 16,000 cases at the Review Commission with at least $195 million in outstanding fines. In 2006, this backlog was only 2,100 cases. Mine operators can be subject to progressively steeper fines or even shut down if cited for multiple serious health and safety violations. Today, mine operators are contesting two-thirds of all fines. Some of the largest mine owners are challenging nearly every citation.